Viewed from the south-east. Beneath the steam engine and wagons at the lower right of the picture are the words 'Great Northern Railway near Terminus Belfast'. Behind the tall chimney is the Distillery Football Club Ground. To the lower right of it there is a sign which reads 'Distillery Footba', with the 'll' hidden behind a building. The Royal Irish Distilleries were built in 1869. This painting and the other paintings below are from a poster advertising Dunville & Co. Ltd. One of the paintings is of the Head Offices in Arthur Street, which were built in 1906, and so the pictures would have been painted in or after 1906. Viewed from the north-east, where they are approached from Distillery Street. The four-storey building with three hipped-end roofs, left of centre, and the chimney on the right, are also visible in the painting above. 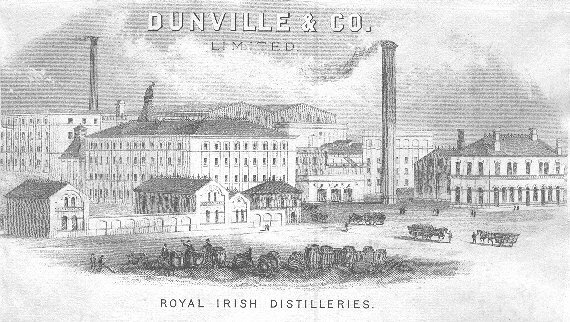 Dunville & Co. was incorporated in 1879, becoming Dunville & Co. Limited, as written on the engraving. The engraving would therefore have been made in or after 1879. Viewed from the south-east. This painting extends to the right from the painting at the top of the page. The entrance in the centre faces Distillery Street, to the right. The Distillery Football Club Ground is to the left of the large warehouse with six gables, in the centre. The four-storey building with hipped-end roofs at the lower left of the painting is also visible in the painting and the engraving above. However several changes appear to have been made to other buildings between the dates of the engraving and the painting. Old map of west Belfast showing the Royal Irish Distilleries to the left of the centre, the Distillery Football Club Ground to the north of it and Dunville Park at the top left. The U-shaped building in the painting above the map is visible on the map at the north-east corner of the Royal Irish Distilleries. However the large warehouse with six gables in the centre of the painting appears to have been placed on the location of the Football Ground on the map. Other buildings on this map include, in alphabetical order, Boyne Bridge Works, Brick Works, Deaf & Dumb Institution, District Lunatic Asylum, Dufferin Children's Hospital, Grosvenor Finishing Works, Hippodrome Opera House, Linfield Pty. (Weaving), Mulhouse Works (Weaving & Finishing), Queen's College, Royal Academical Institution, Royal Victoria Hospital, and Union Workhouse. To the lower right of it there is a sign which reads 'Distillery Footba', with the 'll' hidden behind a building. The Distillery Football Club was formed in 1880, with the support of the Directors of Dunville & Co. Ltd. It was based at Grosvenor Park in Distillery Street until 1971, after which it shared Skegoneill Avenue and Seaview with other clubs. In 1980 it moved to New Grosvenor Stadium, Ballyskeagh, County Antrim, and in 1999 it changed its name to Lisburn Distillery Football Club, after the borough, now a city, in which it is located. The Distillery lives on in the name of the Football Club. The still house contains the large copper pot stills in which the fermented liquid is boiled to separate the alcohol from it. This photograph was taken by Thomas Holmes Mason (1877-1958) and is part of the Mason Photographic Collection of the National Library of Ireland. The still house contains the large copper pot stills in which the fermented liquid is boiled to separate the alcohol from it. This picture is almost identical to the photograph above it, and must have been painted from it. The pictures were therefore probably all painted for the Dunville & Co. Ltd. poster after the photographs were taken. There is part of a large chimney at the top right of the photograph, which might help to identify the location within the Distilleries. This photograph was taken by Thomas Holmes Mason (1877-1958) and is part of the Mason Photographic Collection of the National Library of Ireland. 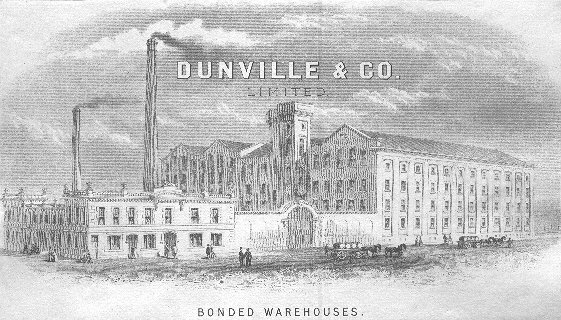 Dunville & Co. was incorporated in 1879, becoming Dunville & Co. Limited, as written on the engraving. The engraving would therefore have been made in or after 1879. These are the bonded warehouses shown in the engraving above, at a later date. Visible in the engraving and on the poster are, from left to right, the two chimneys, the gable ends of two roofs, the sloping side of a roof, the square tower, and the gable end of another roof. However between the dates of the engraving and the painting, the two-storey offices at the lower left of the engraving have been replaced by a large warehouse, and the entrance in the engraving has been moved to the right to make room for more buildings. and is part of the Mason Photographic Collection of the National Library of Ireland. This building is the only building once used by Dunville & Co. Ltd. that still exists. The photograph was taken by Thomas Holmes Mason (1877-1958) and is part of the Mason Photographic Collection of the National Library of Ireland. The offices in Arthur Street were built in 1906. This photograph would therefore have been taken in or after 1906. This is the only building once used by Dunville & Co. Ltd. that still exists. The offices in Arthur Street were built in 1906. The picture would therefore have been painted in or after 1906. The vehicles pictured on this page are all horse-drawn, with the exception of the steam engines on the railway in the top picture. For many years horses were preferred to internal combustion engines for transporting heavy goods such as barrels of whisky, but even this painting in a city street does not show a petrol-driven car. This might indicate that the pictures were painted before 1920. We are very grateful to Terry Thompson for his assistance with this page. Dunville's Whisky Memorabilia, which includes the poster advertising Dunville & Co. Ltd.